If you know where the title quote is from then you will probably recognise my most recent creation. Here, doing the Magic Dance, is none other than Jareth the Goblin King! Labyrinth was, and still is, one of my favourite movies of all time. My Middle Sister and I agreed that only Davie Bowie could have pulled off the Goblin King role. Who else could get away with pants that tight while wearing a pirate shirt and metallic eye shadow? 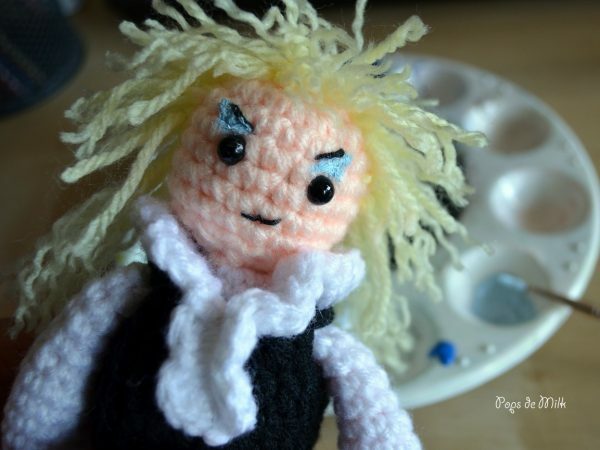 When I first became interested in amigurumi, I remember wanting to make a Jareth amigurumi but at the time didn’t feel experienced enough to even try. I didn’t feel discouraged though, just not ready. And now that I’ve gained some skillz I felt it was time to finally create my first *ahem* crush – I’m not the only one, right? 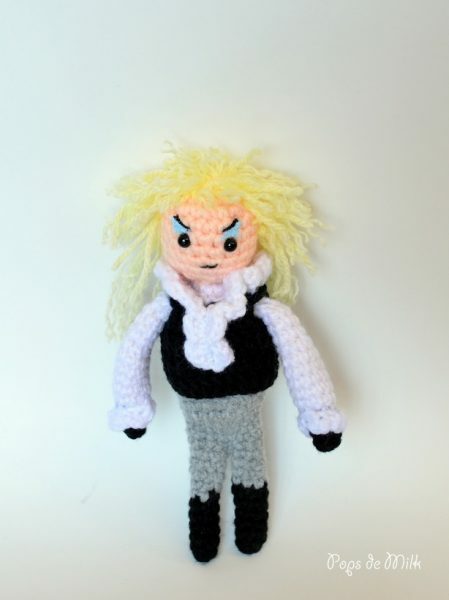 Anywho, I had quite a bit of fun making Jareth, especially the part where I got to put the eye shadow on – was my first time using fabric paint on yarn! 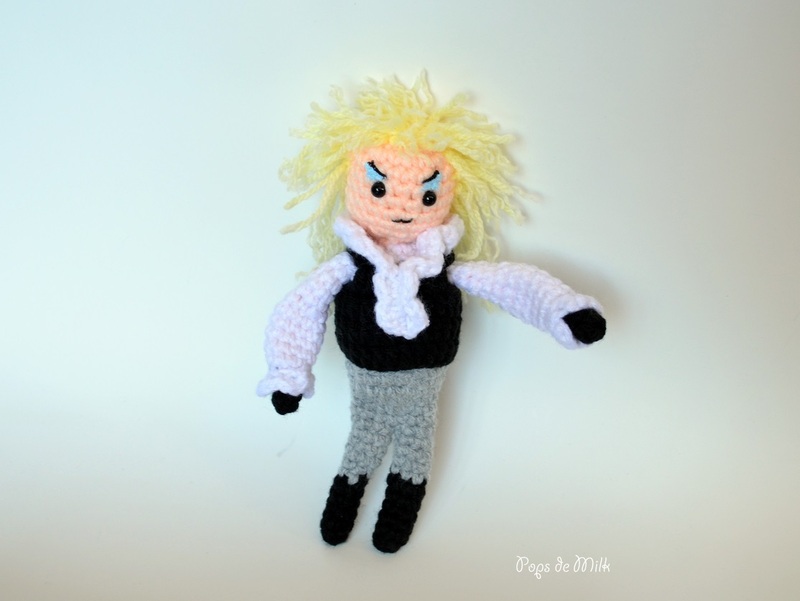 If you want to make your own Goblin King pattern is below or if you want to support my craft skills then head on over to my shop. -Worsted yarn – I’ve used Bernat in White, Peach, Black, Soft Grey, and light yellow. Using peach yarn and 3.5mm hook. Ch 2 and sc 6 in second ch from hook. Attach safety eyes, embroider face, begin to stuff with fibrefill. Continue to stuff and dec until close. Fasten off and leave a long tail for sewing to body. Using white yarn and 3.5mm hook. Stuff with fibrefill and continue to dec until close. Fasten off and weave in ends. Starting with black yarn and 3.00mm hook. Switch to soft grey yarn and 3.5mm hook. Fasten off and weave in ends. Make second leg but DO NOT fasten off. Join legs by pulling loop of current leg through next stitch in fastened-off leg. Fasten off and leave long tail for sewing to body. Put pipe cleaners in each leg if using. Round 4: ch 2, dc in next 3 sts, ch 3, skip next 4 sts, dc in next st, sc in next st, sl st in next st, sc in next st, dc in next 2 sts, ch 3, skip next 4 sts, dc in remaining sts, join with 1st st. Round 5: ch 1, sc in next 9 sts, sl st in next 2 sts, sc in remaining sts, join with first st. Round 1: ch 5, place marker in 5th ch then ch 26, sl st to 5th ch. Round 2: 3 dc in 5th ch, sc in next ch (4th ch from marker), 3 dc in next ch, 3 sc in last ch. Working on other side of ch 3 dc in next st, sc in next st, 3 dc in next st. Continue in this pattern [3 dc, sc] around circle. Fasten off and leave long tail for sewing to body/vest. Ch 9, 3 sc in 2nd ch from hook [sl st in next ch, 3 sc in next ch] repeat to end. Fasten off and leave tail for sewing to sleeve. Sew 3” strips of pale yellow yarn along a 2.5” strip of scrap fabric in similar colour to yarn. Attach this to the bottom back of the head – this creates the bottom layer. 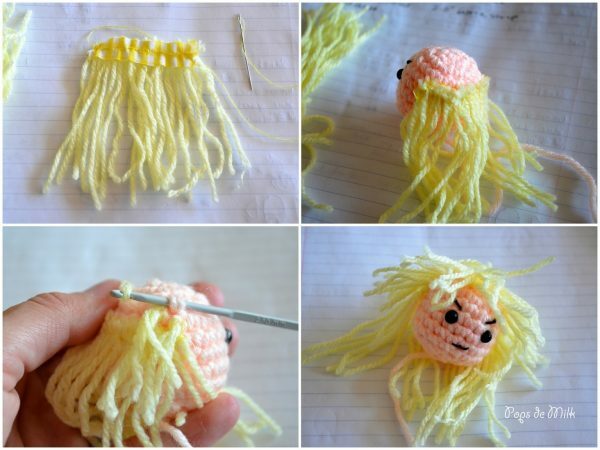 In the remaining stitches, loop through more strips of yarn until head is covered. Give hair a trim and then, careful not to yank hair too much, pull the strands apart to give it a wilder 80’s look. Sew pants to body. Position vest and shirt frills on body and with frills yarn tail sew both pieces to body. Insert pipe cleaners (if using) into arms and attach through holes in vest to body. Sew head to body and, as a finishing touch, you can add makeup. I used fabric paint and a fine paintbrush to paint a bit of eye shadow – I mixed a tiny bit of blue into white paint. If you get paint on the eyebrows you can easily touch it up with a fine-tipped black permanent marker. And now he’s ready to dance and rule over the goblins! My sister had/has a thing for Jareth- she even dressed up as him for a party once. I think if I make this for her she’ll burst. This is my new favourite thing I have ever found on the internet! I love Labyrinth mostly because of David Bowie! Thanks so much for this pattern. Incredible! My bff is going to pee her pants when I make this for her upcoming birthday!